Alexander Hamilton was one of many Americans who took up the cause of Revolution after the Battles of Lexington and Concord. Hamilton, who was attending King's College (now Columbia University) at the time, joined the New York militia, earning himself the rank of lieutenant. Hamilton became an artilleryman after leading a successful raid on British cannon in New York City. After mustering a new sixty-man artillery company, Hamilton was elected captain, and he and his men fought in the Battle of White Plains and Battle of Trenton. The following year, Hamilton was offered a position as George Washington&apos;s aide and given the rank of lieutenant colonel. Hamilton served four years under Washington, including the six-month encampment at Valley Forge. As a trusted aide, Hamilton would have had his own office inside Washington&apos;s headquarters, where he was responsible for drafting many of Washington&apos;s orders and letters, as well as performing work as Washington&apos;s emissary to senior officers. During this time, Hamiton also developed a close friendship with the Marquis de Lafayette. 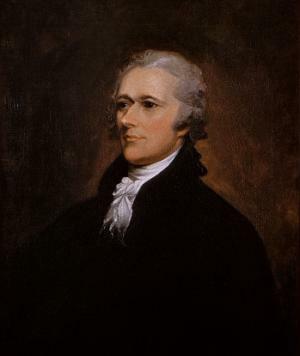 After the siege of Yorktown, Hamilton set out on a political career, representing New York in the Congress of the Confederation, and again in the Constitutional Convention. After Washington&apos;s election as president, Hamilton would again serve under him, this time as the country&apos;s first Secretary of the Treasury. In 1804, Hamilton engaged in a fateful duel with then-Vice President Aaron Burr. Hamilton missed with his shot, but Burr was on-target, inflicting a fatal wound to the abdomen. Hamilton died the next day.